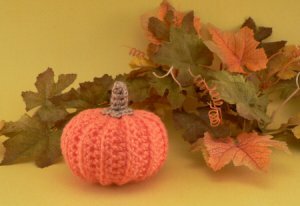 Pumpkin is an original crochet pattern by June Gilbank. Crochet yourself a pumpkin - the perfect pattern for autumn! With this one basic pattern, you can create a realistic pumpkin for your Fall table, a cute amigurumi-style pumpkin for the kids, or a spooooooooooooooky pumpkin for Halloween. Date Added: 10/04/2017 by Sarahmarie S.
Date Added: 10/04/2017 by Virginia H.
Date Added: 09/05/2016 by Jackie M.
Date Added: 10/30/2014 by Sharon Y. Date Added: 09/06/2012 by hailey b. Date Added: 05/13/2012 by Monica B. Date Added: 10/07/2011 by Theresa C.
Super easy pattern!!! clear, concise instructions!! I was done in a couple of hours. very cute too! Date Added: 11/30/2010 by Heather C.